Northwest Funfairs are continually striving to ensure that all events no matter of the size are safely planned and completed. We believe that our clients deserve the highest standards and take pride in our service; this said, the safety of the general public and our employees is always top of our priority list. Northwest Funfairs Ltd carry Public Liability Insurance to the amount of £10,000,000.00 (ten million) on all our rides and attractions. Copies of our Public Liability Insurance certificate are available to clients upon request and will also be made available of the day of the event. It’s our guarantee that no game, ride, stall or catering unit will be supplied without correct and adequate cover. All attraction and rides are subjected to a thorough annual safety inspection carried out by an ADIPS engineer before the attraction/ride is passed as safe to operate. Inspection may vary subject to the type, design and requirement of the attraction. 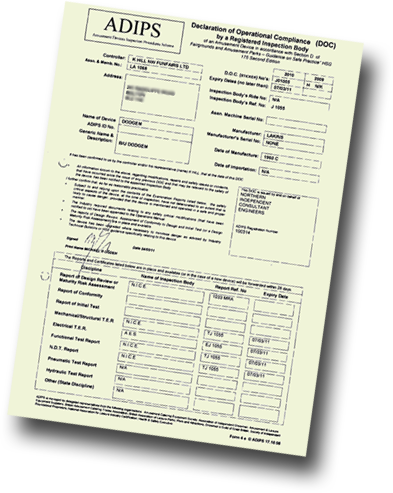 Copies of theses safety certificates are available to clients upon request and will also be made available of the day of the event. All Northwest Funfairs attractions are thoroughly checked every day before opening them to the public. A fully trained member of staff carries out the inspection. Each attraction has its own specific list of things that require both a physical and visual check. Any potential hazards are recorded on the daily inspection check list and reported to management. All issues are then corrected and fully tested before the attraction is open to the public. Northwest Funfairs carries out a full risk assessment highlighting possible areas of concern and evaluates measures which can be take to prevent incidents occurring. All employees are made aware of the part they can play in keeping both themselves and the general public safe.